Whether you’re in the market for that perfect souvenir, for collectibles from each visit to Mexico Beach, or maybe even some fine jewelry, the locally owned and operated shops of Mexico Beach have it all. Check out whimsical pottery, garden accessories, and beautiful blooms at Frost Pottery and The Grove. Check out classic beach antiques and decor at Tammy’s Treasures. Explore the best Mexico Beach souvenirs. Whatever your fancy, we’ve got it! Check out our Shopping Page for directions and contact information for all the great shops in Mexico Beach! 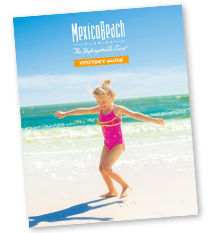 Your complimentary Mexico Beach Visitor's Guide is just a few clicks away. Start planning your perfect beach vacation today! Stay up-to-date with our upcoming events, seasonal specials, and promotions by subscribing to the Mexico Beach Newsletter.